00:20:00 Makes 9 servings, 3 nuggets (18 g) each. Makes 9 servings, 3 nuggets (18 g) each. Chicken nuggets are a family favourite - win some brownie points by serving up our homemade chicken nuggets with a two-ingredient dip. With only 10 minutes of prep, this recipe is surprisingly easy to make. Coat chicken with coating mix as directed on package; place on baking sheet. Bake 10 min. or until done (170ºF). Meanwhile, mix Miracle Whip and barbecue sauce. 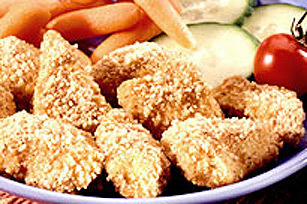 Serve chicken nuggets with barbecue sauce mixture. Serving Size Makes 9 servings, 3 nuggets (18 g) each.